Teknor Apex Company, long a leading producer of medical-grade compounds, has expanded its offerings to device manufacturers with innovations in both vinyl and thermoplastic elastomers (TPEs), the company announced today at MD&M West (Booth 2233). The developments strengthen the role of Teknor Apex as the most versatile supplier of compounds for regulated applications. ● BioVinyl™ flexible vinyl compounds with bio-based plasticizer. Teknor Apex has begun development of flexible vinyl compounds that incorporate phthalate-free DOW ECOLIBRIUM™ Bio-Based Plasticizers, which are manufactured using plant byproducts by The Dow Chemical Company. Under a recently announced Joint Collaboration Agreement, Teknor Apex has been granted the exclusive right to market in North America flexible vinyl compounds containing these plasticizers in certain applications, including medical devices subject to a Dow Medical Application Policy. In uses like tubing and pouches, Teknor Apex expects that these compounds, under the new BioVinyl brand, will provide the performance advantages of vinyl, have a smaller carbon footprint than alternative plastics like polyolefins or polyurethanes, and be more cost-efficient than “green” biopolymers. ● Assembly technologies for TPE tubing. Three new patent-pending systems for use with tubing made from Medalist® medical elastomers enable common-size TPE infusion tubing to bond securely with conventional connectors. The systems include room temperature-cured adhesives, light-cured adhesives, and solvent bonding. Commercially available adhesive and solvent systems used with PVC tubing either do not enable most TPE tubing to achieve sufficient bonding strength or do not permit sufficient work time for ease of assembly. These new systems achieve bonds exhibiting a retention force significantly greater than the minimum required by device manufacturers, and they include a slow-setting option to allow precise assembly control. Introduced at MD&M a little over three years ago, the Medalist range of medical elastomers now includes a wide range of styrenic, olefinic, vulcanizate, and alloy formulations, with hardness offerings ranging from ultra soft gels at 25 Shore OO to hard yet ductile compounds at 85 Shore D. Teknor Apex can further broaden customer options by customizing the surface aesthetics, haptics, clarity, and color. In the process of developing Medalist elastomers, Teknor Apex has collaborated with prestigious medical contract manufacturers to ensure practical, real-world capability, Pritikin noted. “Our recent development of patent-pending Medalist bonding solutions and our demonstrations of the precision and ease with which Medalist-based tubing can be fabricated in post-extrusion techniques are examples of how we are guided by real-world considerations,” Pritikin said. He added that, in addition to being a practical alternative to PVC, Medalist elastomers can replace thermoplastic polyurethane and thermoset elastomers like silicone, latex, and polyisoprene. Teknor Apex’s medical-grade PVC offerings include Apex® flexible vinyl molding and extrusion compounds, Apex® rigid molding compounds, Flexalloy® ultra high molecular weight PVC elastomers, and calendered PVC film. The Apex range of flexible compounds includes numerous gamma-stable, non-DEHP, and non-phthalate options. 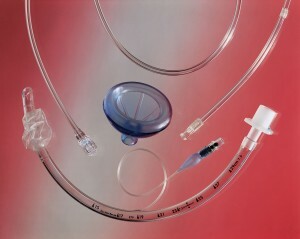 A clear, gamma-stable Apex rigid compound is available for tubing connectors, luer locks, valves and other medical components.